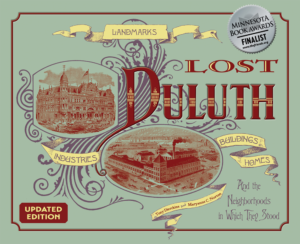 As one of the 1881 incorporators of the Duluth Board of Trade, Owen Fargusson made a fortune as a grain commissioner and served as the board’s president from 1888 to 1889. In 1883, with grain money lining his pockets, Fargusson commissioned George Wirth to design a business block that deserved attention. The Fargusson block was four stories of white Lamont marble topped with an elaborate iron cornice, squat towers above the cornice, and classical detailing on the façade—and the Fargusson name carved in stone. In 1886 he added a second building next door. The second Fargusson Building looked very different from its neighbor: at three stories high it was shorter, and its brick-and-brownstone facing contrasted with the white marble of the 1883 building. It featured elaborate details as well: a rounded corner and twelve decorative pillars at the roof line, a patterned brick cornice, and stone lintels. Fire gutted both buildings on December 27, 1892. While the 1886 building was heavily damaged, the 1883 Fargusson was completely destroyed. In March of 1893, the older marble building was razed. 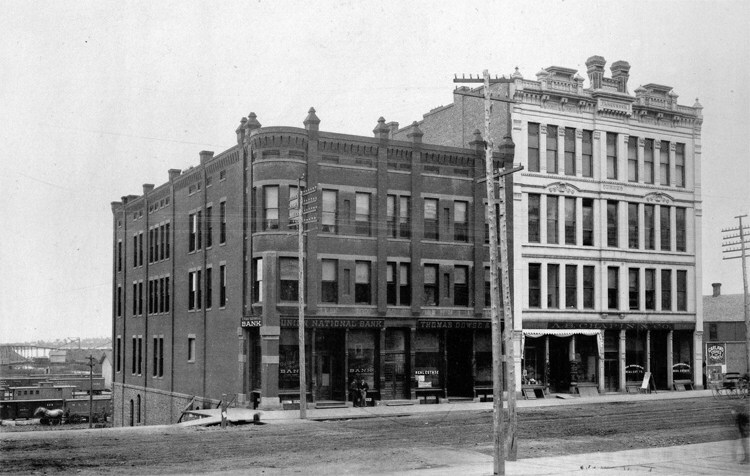 The 1886 building was rebuilt, but without any of its original design features. It was later extended west over the footprint of the first Fargusson block and converted into Duluth’s Greyhound Bus Station, operating as such until 1983. Today it is home to National Title and other businesses.